In the following, we want to introduce you to the world of the first big transmedia storytelling project created and produced in Hollywood. Some of you may know it, some of you might, due to the moderat success, not. There is talk of the TV series „Push, Nevada“. Designed for a 13 one-hour-long episode plot, only seven episodes of the first seasons found its way to the viewer’s eye. Push, Nevada is an american mystery television series which aired on September 17th 2002. Responsible for the ambitious project were no less a duo than Ben Affleck and Sean Bailey. IRS Agent Jim Prufrock (played by Derek Cecil), who travels to the imaginary town Push in Nevada, appears to be the center of attention. He is sent to the mysterious town in the middle of nowhere to investigate an accounting error made by a local casino. Soon after his arrival he begins to wonder if the seemingly innocent accounting error is the only thing being shady in this inconspicuous town. After looking further into the towns suspicious, plain image, he drags himself into a case which appears to be much more than simple fraud. This is where it gets interesting and where we want to leave the rest to your imagination. Because this specific case is not only equatable to the main plot of the series, but also the most interesting aspect of „Push, Nevada“. Why is „Push, Nevada“ relevant? Even though the show has been cancelled after seven episodes, it constitutes a milestone in the history of transmedia storytelling. Not only in Hollywood, but all over the entertainment business. Being the first ever produced transmedia TV Show, „Push, Nevada“ combines the elements of a story and a game, of fiction and reality. Having a first class production team (LivePlanet) with icons such as Matt Damon, Ben Affleck and Sean Baily backing the project, network television as form of distribution and a million dollars price money, the omens were favorable for the Show. The one big mystery around Push was going to be solved step by step in 13 sixty minute episodes. Each episode the viewer got a clue which led to a clue in the next episode, which led to a clue in the next episode and so on. If a member of the audience was able to get all the clues right he would get the 1.000.000 Dollar as a prize by calling a telephone number which concluded itself from combining the clues. 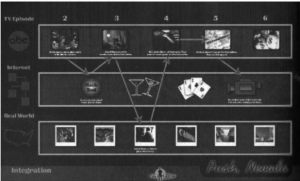 Therefore, the most interesting part of „Push, Nevada“ was not necessarily watching the show but much more solving the puzzle yourself. To intensify this experience of participating the production team helped oneself by using different multimedia elements. One of which was, obviously, the show. But furthermore you could use mobile apps, surf on false websites, read the book to the show, even get text messaging and Real-life events were included. 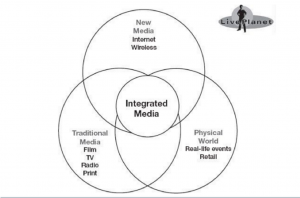 For the audience not to get confused by all the input, the team entrenched an so called „Integrated Multimedia Timeline“ which should outline the relationship between the different types of media and platforms. Bailey called this approach the „Three-Ball-Theory“ (Rose, 2011). So basically, the audience was able to participate by using traditional media, new media and even the physical world, or, using the analogy Larry Tanz so appropriately made use of, the viewer can wade into the waters, float out or even completely dive in. So, why did „Push, Nevada“ fail? It, sadly, is as simple as that: „Push, Nevada“ just did not catch on. One might argue that the early 2000s were just not the time for a transmedia-driven show as complex as Push. 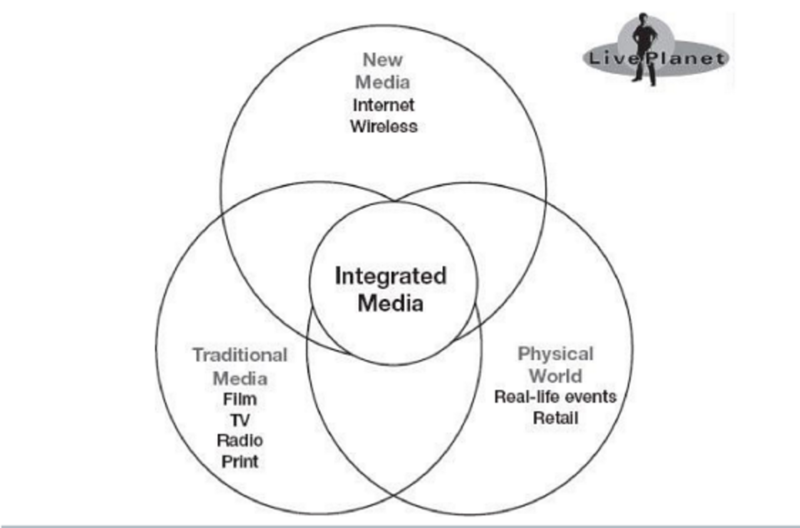 Maybe the implementation of the different media paths was deficient. Perhaps the American journalist Andres Serwer was right all along by reporting in Fortune: „The Folks at ABC are going gaga“. Because we do not want to do unjustice to „Push, Nevada“ it is relevant to mention that many measurements actually showed that a whole lot of people were closely following the show/game. As Carolyn Handler Miller puts it: „About 200,000 people visited the Push,Nevada websites, which made it one of the largest online games in history (…)“ Over 100,000 viewers actually figured out different phone numbers by following the clues closely enough and 60,000 people downloaded the book written for the show. By total estimation, ABC guesses for over all 600,000 people bing involved in „Push, Nevada“. One last word for the ending to leave you all with the answer to the question probably everyone was asking himself: after being cancelled in before all the episodes aired, ABC revealed the missing clues giving one person the chance to be the first to put them all together and call the following number: 866-445-6245. The prize was won by Mark Nakamoto from New York. Lucky guy! Um hum, the game is still on, the answer to where the money is was not solved by a phone number. That was another red herring for the sheeple. And if Mark is real then there is a much more complicated game for the super sleuths still going on.